Are you thinking about becoming a cable-cutter? Do you look at the cable bill with dismay every month? I found I could save $70 a month by just paying for internet service instead of a full-service cable. I’m happier than ever with more shows to watch than before and a variety of movies and specials to chose from. I added an antenna so that I could access 20 local and national channels mostly for local news and sports. The other essential tool-the Roku streaming stick. I had an early version of the Roku streaming media center but found the interface to be more trouble than it was worth. The new Roku streaming stick beats the Chomecast and the Amazon Fire on speed and variety of available programming. A win win situation. The Roku streaming stick allows me to access both netflix and hulu so I had to make a decision whether I wanted or needed one or both of these. I chose Hulu (unfortunately with annoying commercials) because of the exclusive programming that only airs on Hulu (the show Nashville ’cause I’m hooked). Accessing either service is easy once to enter your log in and password for Hulu or Netflix. If you are an Amazon Prime subscriber you can access all of that programming as well as Vevo, YouTube, CBS news, PBS kids, Sling,FX Now, Red Bull TV, Watch ESPN, and Pandora. If you subscribe to Showtime or HBO to go, you can watch all of this programming as well. Some channels require rental fees for certain programming. Setting up the stick was easy even for the non-techie me. The important thing is to know what HDMI slot you put the stick in. Use your input on your television so that you can see the set up for the streaming stick. Configure your account and you are finished. 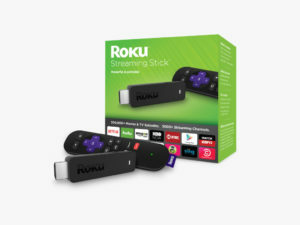 The Roku streaming stick sells for $49.99 and is available at all of your big box retailers as well as from Amazon Prime (free 2 day shipping) here.